While it’s always nice to see winter leave, the hot, humid temperatures of high summer do not appeal to all people. Even if you have air conditioning available, stepping outside during a heat wave or having to endure if the electricity fails can make summer a misery. If you have become tired of the heat and long to enjoy a bit of cold weather in July or August, you may well find one of these vacation spots to your liking. The Aurora Ice Hotel is probably the very coldest hotel on earth. 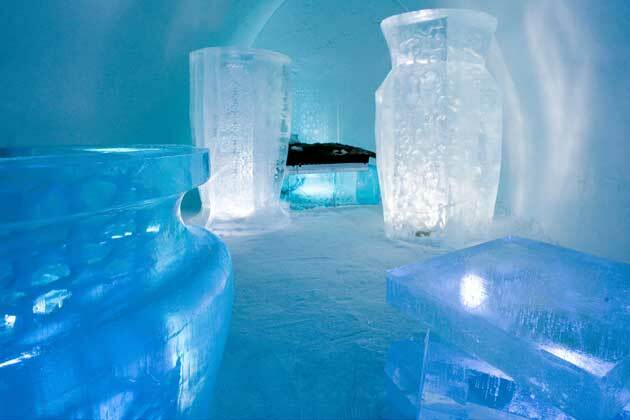 Located north of Fairbanks, Alaska, this hotel and museum is made entirely of ice. The temperature inside the hotel is approximately 20 degrees Fahrenheit, so you will have no trouble cooling off inside. You will be provided with parkas and boots that will help you to handle the cold and the nearby resort is available when you want a shower, or want to warm up a bit. The Kulmhotel Gornergrat is the perfect place to escape the summer heat when you’re travelling in Switzerland. Located near St. Moritz, you will not only find world class accommodations, and summer temperatures that only reach the 50s. This is one of the highest hotels in the world, perching 10,000 feet above sea level on Gornergrat Mountain. A funicular railway takes you from Zermatt to the hotel. Purcell Mountain Lodge in British Columbia, Canada, is nestled right in the mountains and surrounded by glaciers. It is only accessible by helicopter, and at an elevation of 7,200 feet, provides respite from summer’s oppressing heat. Cozy rooms, all with a view of the Selkirk Mountains and an on-site restaurant provide the perfect summer getaway. The Northern Hemisphere summer is the perfect time to visit Whare Kea Chalet and Lodge near Lake Wanaka, New Zealand. This hotel is located in the Southern Alps. The Southern Hemisphere enjoys winter when the Northern bakes, so Whare Kea will allow you to bask in the very moderate and pleasant 50s. There are 2 suites and 4 rooms available for guests, and a dining room is on the premises. The view from the hotel is remarkable and unforgettable. Perhaps the ultimate in escaping the sticky heat of summer is a cruise to the Arctic. Rather than staying in a stationary hotel, your cruise ship will provide your lodging and food, as well as tours of areas in the Arctic Circle. These tours usually wait until the pack ice has receded a bit and are conducted from late June through September. Not only will you be able to get away from hot temperatures, but you will also see glaciers, polar bears, seals, and other natural wonders of the northern world. For those who are seeking a way to get away from the heat and humidity of summer, there are some excellent choices in all parts of the world that will let you cool off and relax. Just don’t be caught off guard – pack like you would for the winter! Noc enjoys visiting cold area when the heat is too much in the summer and often uses Travel Advantage Network for accomodations.